Every secure page is prefixed with a 'https' web address because these pages usually require some form of personal information which we protect using the latest encryption methods. Two such examples where you will see secure pages on our site is when you sign in/register or when you're about to complete your shopping and you're at the checkout page. Please see below a sample of screenshots which have been created specifically to indicate how you can check how secure our site is. Screenshot #1 showing the web address bar - the padlock (normally grey but the hovered over version's shown below) indicates you're within a secure page. 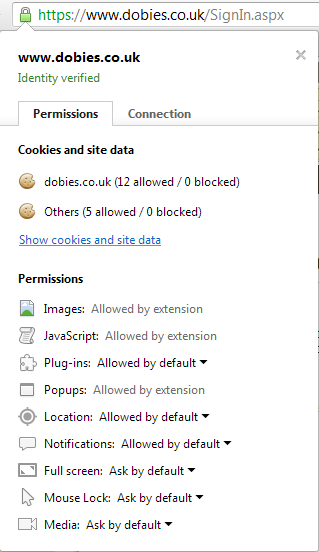 Screenshot #2 which shows the 'extended' information if you click the padlock. Screenshot #1 showing an area of the web address bar changing to a green colour indicating you're in a secure page. Screenshot #2 which shows the 'extended' information if you click the green bar or the padlock. 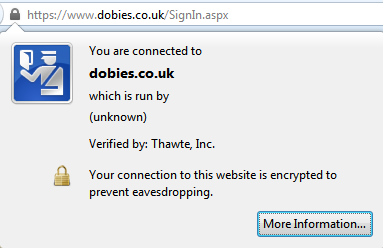 Screenshot #1 showing an area of the web address bar and the padlock indicates you're in a secure page. 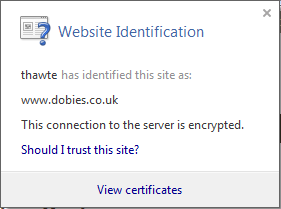 You can also view our Thawte site security certificate information at any time in your browser simply by clicking the padlock as shown above.